There are a great many books now available describing the complex rituals and esoteric significance of the ancient practices of Buddhist tantra. But none take the friendly, helpful approach of Geshe Tashi Tsering's Foundation of Buddhist Thought series. Understanding the many questions Westerners have upon first encountering tantra's colorful imagery and veiled language, Geshe Tsering gives straight talk about deities, initiations, mandalas, and the various stages of tantric development. He even goes through a simple tantric compassion practice written by the Dalai Lama, using it to unpack the building blocks common to all such visualization techniques. 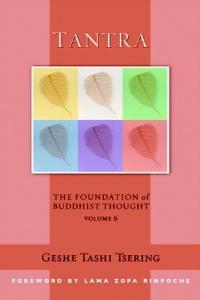 Tantra is a fitting conclusion to the folksy and practical wisdom in the Foundation of Buddhist Thought series. Paperback, 2012 edition, 216 pages.